PsychologySalon: The Mental Movie Screen, Part 2: Panavision or Pinhole? The Mental Movie Screen, Part 2: Panavision or Pinhole? Last week I talked about a metaphor I sometimes use in therapy: The internal movie screen. We feel like we're reacting to the outside world, but really we only see a selective bit of reality limited by our perspective, our senses, and our attention. Once we've got the movie screen in mind, we can add a few more ideas. 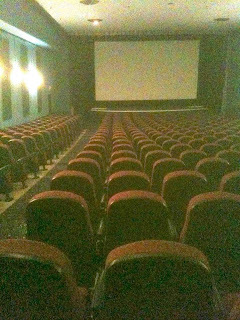 Have you ever been in a movie theatre and, just before the movie starts, the black frames around the screen slide in or out to accommodate the shape of the movie image? The sides slide back for a widescreen film. Sometimes the top and bottom move in a bit. In the Tuesday post last week we considered how mental experience is not based on reality, but on a perceptual representation of reality that is never really complete. The metaphor for this internal representation was a movie screen. This week's point: The screen isn’t always the same size. Sometimes it shrinks. When you’re stressed out, it gets smaller. You can’t pay attention to as many things at once. Perhaps you’ve noticed yourself losing or forgetting things. Or you’ve been trying to work out a mental problem that you can normally solve, and it somehow feels like your mind isn’t big enough to hold the concepts. This is like making a familiar recipe and finding that the pot is overflowing. Someone shrank your pot. In times of stress, the screen's frame moves in, shrinking what we might call your attentional field. What could normally fit, doesn’t. That’s okay, if you have a pretty simple task. Running, say. Or sorting nails. But if you have a complicated task, like performing mental arithmetic, or writing a story, or resolving a dispute with your partner, you just can’t do it. Depression shrinks the screen too. What widens it? Relaxation helps. Meditation can be a good strategy, helping to pull the frame back. Being in a natural setting seems to do it for many people, strangely enough. There’s something about sitting comfortably overlooking a large expanse that seems to allow the mind to calm itself and spread out. So if we’re depressed or anxious or burnt out, what should we do? Well, obviously, we can do those things which have usually worked for us in the past. Head to the lookout, sit on the meditation cushion, practice yoga, breathe using the diaphragm. But when we are distressed these strategies, though they may help, will seldom work as well as they usually do. They’re still worthwhile, even though we may feel dissatisfied with the results. The other task is acceptance. We need to acknowledge that our minds have shrunk before, and they will do so again, over and over throughout our lives. And this has not harmed us directly in the past, and is unlikely to do so this time either. Stop multitasking. When we switch from one task to another, we shuffle what we were working on to a corner of the screen, and use the remainder of our attention for the task at hand. But having a smaller screen means we need to devote as much of it as we can to the task. Normally we might be able to process two things at once, or alternate between tasks, but while our attention is impaired we are best advised to simplify. Clear the space. Normally we can filter out the demands of the environment, or tolerate their pleas for our attention. But when we are stressed or depressed, this becomes more difficult. So we can cope by tidying everything away except for the task of the moment. Reduce interruptions. Find a way to get blocks of time free from distraction. The phone and television are turned off, the family knows to leave us alone for an hour, and for a specific time our privacy is sacrosanct. Stop rushing. We can let go of our usual expectations about how long things will take. Normally we can calculate the month’s receipts in an hour. With our reduced attentional field we will allow and expect ourselves to be slower, relinquishing the temptation to hurry. We will use the calculator for sums we could ordinarily do in our head. We will write down our reasoning. We will double check. Ritualize. Normally you can toss your keys anywhere and remember where you put them. Now we need simplicity, and we don’t want to spend hours hunting for things. So we can put a bowl by the door for the keys and cell phone. We underschedule a bit so we aren’t rushed. We push ourselves just a little bit more to put things away rather than leaving them out, occupying a fragment of the movie screen, calling to us. And we stop criticizing ourselves, which only shrinks the screen more. We begin to see the mental movie screen as less solid and more fluid, subject to expansion and contraction over time. When it contracts we avoid attributing this to a permanent characteristic of ourselves (“I’m so stupid”). We strive to welcome the opportunity to practice simplicity and clarity.